It is beleived that Louis Roussy founded LR sometime between 1926 and 1928. There is very little information available regarding the creation of the company. 'LR' are the initials of Louis Roussy, and also of the 'O' gauge trains he named 'Le Rapide'. In the 1930's a factory at 61 rue Corvisart in Paris, France passed into the hands of industrialist Louis Roussy. With his partner René Trubert, this inventor designed lead soldiers, small cars and the miniature electric and clockwork driven trains sold under the brand name Le Rapide or LR. The company also marketed model planes and ships. A factory was built in Trappes, in Yvelines over a 2 year period between 1930-32. But starting in 1934, it was the Corvisart street location that LR would use as its commercial address and business headquarters. It was Louis Roussy's intention to produce quality toy trains for young customers by using carefully chosen materials, such as thick sheet steel, wood, brass and later, cast aluminum. He studied and filed numerous patents for electric motor design, gearing and coupling systems. The LR catalogs bore a variety of mechanical and electrical equipment. The trains produced were beautiful and were considered more finely finished and more loyal to French prototype than those made by competitors Hornby or JEP. LR operated until 1956. The brand was sold in 1961 to JEP. Louis Roussy was a Swiss citizen born into a large family of industrialists who owned, among other firms, the famous brands Nestlé, Peter, Cailler and Kohler. A 1934 advertisement for Jouets Le Rapide LR promoted "the fastest train in the world of toys" (le train marchant le plus vite dans le monde des jouets). These were electric trains equipped to operate on 20 volt current. LR trains were not scaled to the 1/43.5 'O' gauge standard. They were closer to a scale of 1:60. Although they operated on 'O' gauge track, these trains were smaller in size and with less mass were capable of exhibiting higher speeds without derailment. Hence their name: Le Rapide. The same 1934 ad offered 60 model wagons priced from 10 to 50 francs and complete ready to run sets including a #1009 Paris à Orléans (P.O.) Merchandise train, a #1010 Paris à Lyon et à la Méditerranée (PLM) Passenger train, a #1007 P.O. Merchandise set with an 8-wheel locomotive, a #1008 Etat (State) Passenger train with a Mountain style locomotive and a #1001 Auto Rail passenger car. The ad stated that all toys made by LR were based on their own French patents. And that the locomotives were equipped with automatic reversing capability. 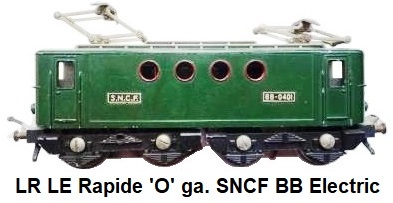 The LR Company eventually offered locomotive #1005 which was the first true model version of the French Société Nationale des Chemins de fer Français (SNCF) 2D2 electric engine, where the number of wheel axles appeared equal to the prototype locomotive (8 axles or 16 wheels). However the LR engine was actually a 3B3 since only the 2 central axles on the model were powered. This solution was developed by Aldo Zedda, the future co-founder of BLZ trains, who at the time was working as a subcontractor for LR. Louis Roussy and his French business partner, former architect René Trubert, were awarded a number of patents for toy and train inventions. The first one was French patent FR 640 515 (A), applied for February 16, 1927 and issued April 2, 1928. This was for a coupling device which results from the juxtaposition on the same piece of a hook with notch and a lock in conditions that ensure locking by simple approximation and separation by finger pressure. The lock consisted of an axis riveted to a small rectangular stirrup. In another example, the lock consisted of an axis formed of a wire suitably curved in the form of a stirrup terminated by a small hanging ball. The coupling was facilitated by lifting the axis of the lock utilizing the hanging part (a stirrup equipped with a ball or not) so as to remove the axis of the notch of the hook. This patent describes and introduces the first coupling mechanism mounted on LR vehicles between 1927 and 1933, with its two variants depending on the presence or absence of the small hanging ball. The second patent was French patent FR 691 386 (A), applied for February 13, 1930 and issued July 8, 1930. This invention consisted of a device for raising the spring of the drive mechanism of a toy (for example that of a locomotive mechanical toy) without touching it by turning its mechanism in the opposite direction to that of its normal operation. Patent #3 was French patent FR 696 997 (A), applied for May 22, 1930 and issued October 21, 1930. This invention was a new type of coupling mechanism described as 'automatic' utilized by LR on its trains from 1935 to 1939. According to one of its essential characteristics, this new type of hitch comprised a pivoting head of 'special' shape equipped with one side of a flared notch and the other side of a hook. During the hooking, the hook of one hitch penetrated into the notch of the other hitch and vice versa, and to unhook, the head would be turned to disengage the hook from the notch. 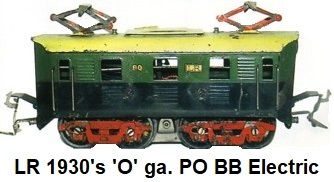 This unique design allowed LR trains to couple with other manufacturers 'O' gauge trains, specifically Hornby's old model, despite the differences in scale and buffer height, while remaining compatible with the previous LR offerings. By 1936 LR also offered a rail control mechanism to allow operators to trigger coupling and uncoupling actions remotely. Patent #4 was German Patent DE 581 981 (C), requested September 11, 1931 and published July 20, 1933, priority FR of September 24, 1930. 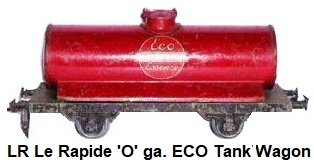 This invention, developed by René Trubert, related to a control device for toy locomotive electric motor collectors of the type developed by JEP in 1929 (JEP patent #3). Its design involved the installation of a movable lever whose position was dependent on the magnetization force created by the wound inductor and whose movement, which was adjustable, would actuate a kind of switch managing the direction of rotation of the motor. By varying the track voltage, reversing of the locomotive was facilitated. Patent #5 was French patent FR 815 449 (A), applied for March 24, 1936 and issued April 12, 1937. This patent described and claimed a remote control method for the direction of rotation of a DC motor equipped with an inductor having a single winding consisting of making, taking into account the polarity of the supply conductors, the inversion of the field in one of the two circuits of the motor to be controlled (inductor or armature) by means of a rectifier of the type of those used for the transformation of alternating current into direct current. This was the second time that a French manufacturer of electric toy trains utilized a rectifier to remotely control the direction of travel of a locomotive. The first who tried to go in this direction was JEP (JEP patent #8 of 1935). Such a rectifier technique had already been studied in Germany by Märklin a few years earlier. According to a first embodiment of the invention, the method was applied to a 'series' motor and the rectifier was then located between the inductor and the armature. In a first variant, the respective provisions of the armature and the inductor relative to the rectifier were such that in the armature the current was always maintained in the same direction whereas it can be reversed in the inductor while playing on the polarity of the power source. In a second variant, the respective provisions of the armature and the inductor with respect to the rectifier could be reversed so that in the inductor the current is always maintained in the same direction whereas it can be reversed in the same direction, induced by playing on the polarity of the power source. According to a second mode, the method is applied to a motor 'bypass' and the rectifier is then located in the circuit of the inductor. Patent #6 was French patent FR 820 149 (A), applied July 9, 1936 and issued July 26, 1937. This patent supplemented patent #5 using a rectifier but now proposing a method of remote control to change the direction using rotation of an electric motor applicable to an electric toy locomotive powered by alternating current. The LR approach, in accordance with patents #5 and #6, competed with a new system implemented by Märklin in 1935 and described as "the ideal reversing remote control for the direction of travel", also called "inversion reference 70". The new LR system, as described, utilized (similar to Märklin) the implementation of a 'series' motor with a double-wound inductor. In the case of alternating current, with transformer, the LR system utilized a suitable unique rectifier device located at the output point of the transformer. The determination of the direction of travel was made by selecting, via the rectifying device, one or the other windings of the inductor. In this system, the windings of coils are such that, whatever the selected winding, the rectified current always travels the inductor in the same path while it passes through the rotor in one direction or the other depending on the chosen winding. The Märklin system called 'inversion reference 70' is protected by French patent FR 760 932 (A), requested on September 18, 1933 and issued December 27, 1933. This system, in the case of alternating current, comprises two separate rectifiers (each based on selenium cells). One located at the exit of the transformer. The other mounted in the locomotive between the central rail and the double-coil inductor. In the LR catalogs, electric locomotives are quoted several times with the mention, in the period 1935-40, of 'automatic reverser', then the mention, in the period 1948-55, 'tele-inversion'. It was hypothesized that the first mention should be matched with patent #5 while and second reference should be matched with patent #6. Patent #7 was French patent FR 820 714 (A), requested July 20, 1936 and issued August 9, 1937. It relates to sound equipment applicable to electric toy trains for remote control of a sound signal mounted on the train and able to operate whether the train was running or stopped, under the action of a musical frequency current generator. 2 additional patents existed that were outside the field of toy trains. One was the French patent FR 750 012 (A), requested on February 3, 1933, which concerned a construction toy/assembly system (resembling Hornby's Meccano) consisting of metal construction toy elements based on metal strips, angles, brackets, plates, and disks. These elements being pierced with close holes, said system allowing replacement of screws and nuts in whole or in part by simple clips or special staples. This became the famous toy called "Standard LR" and corresponding foreign patents were GB 434,802 (A) and US 2,032,955 (A). 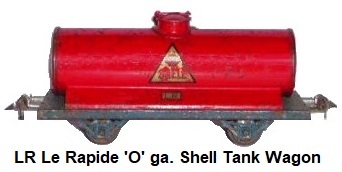 Prior to 1936 Le Rapide mainly produced toy trains. In 1935 René Trubert was asked by Roussy to design an electric car racing system. The resulting toy invented was completely original. It employed stylish scale model autos that rolled along freely on a metal roadbed that did not utilize a slot or central guide like most other road racing toys. 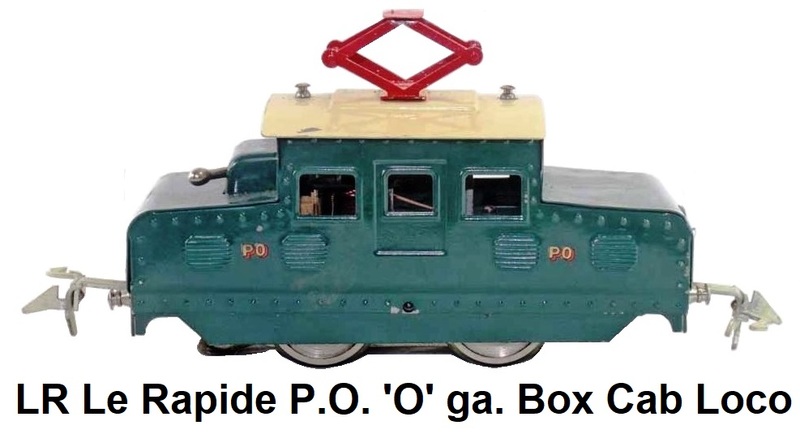 By the end of August 1936 Louis Roussy began promoting his great new novelty item "L'Auto-Route LR" to toy dealers announcing it as a revolution in electric toys, and that this toy would be an attractive item for their shops and catalogues. It was also touted as an ideal product for Christmas giving in 1936. A French patent FR 797 206 (A), was requested on January 24, 1935 related to a device for guiding toy vehicles. This was for the track consisting of the metal roadbed on which the motor vehicle models ran and which had one or two special borders that served to guide the vehicle during its race around the track. Production of the Le Rapide auto racing sets was in very small numbers due to the expensive price, and ceased with the outbreak of World War II, making these sets very rare and valuable to collectors. 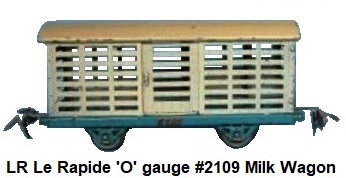 From 1932 to 1940 LR produced an 'O' gauge model of the Michelin type 5 rail car using Zamac. These rail cars were unique, as the prototypes that ran on French, North African and British railways utilized a specially developed rubber and steel wheel called the pneumatic railroad tire. Developed by Michelin, these tires offered a number of advantages over the traditional wheel type in this relatively lightweight application. Passengers experienced a smoother, quieter ride. Better traction resulted in faster acceleration, shorter braking distances and improved climbing ability on grades. Greatly reduced rail wear likewise resulted in reduced track maintenance costs. Downside factors included higher fuel consumption caused by increased drag and the possibility of flats. One Micheline prototype ran from Paris to Deauville averaging 107 k.p.h. (66.8 m.p.h.) on September 10, 1931 using Hispano-Suiza power. The long term success of the Michelines can be said to have led directly to the use of rubber tires on many modern metro systems around the world including Montreal, Quebec, Canada, Tokyo, Kobe and Yokohama in Japan, Paris, Lyon and Marseilles in France and Mexico City. One of the rarest locomotives, and most highly sought after LR trains was the Super Rapide European type 241 (N. American 4-8-2) Mountain Streamlined Steam Outline Loco created in 1937. At 51cm long, it is the longest locomotive that LR ever produced, and the rarest version was painted in royal blue. During World War II LR reduced activity in its commercial premises located on Corvisart Boulevard in Paris, while the Trappes factory was destroyed. After the conflict ended the brand was purchased by M. Chauvel who, in 1949, created the Electrical Industries of the Seine. LR products continued to be made within this group at a new plant located at 97 avenue de Verdun in Romainville (Seine-Saint-Denis). The manufacture of LR toys continued through the 1960's. The brand was taken over in 1961 by JEP, who decided to discontinue production of the LR trains. From 1926 until the 1960's LR produced some of the most interesting tinplate trains in France using Zamac pot metal for the wheels and some locomotive castings. These tend to suffer from Zinc-pest. Zamac is an alloy consisting of Zinc at 95% in proportion, Aluminum at 4%, Magnesium present in traces and copper (Kupfer in German) at 1%. This alloy has the unfortunate tendency to catch an irreversible disease referred to as Zamac plague, Zamac cancer or metal fatigue. The result of this disease is that the metal suffers from cracks and eventually falls to dust. This disease is common on old castings and is more easily caught if the alloy contains lead impurities. In the early 20th century the metals utilized were poorly purified and lead would be the catalyst of the reaction. The reaction would act on the structure within the bonds of the atoms and would generate a new type of binding that increased the volume and size as much as 10 to 15%. The swelling would result in deformations, cracks, breaks, and the eventual transformation into dust. This disease is also triggered when the object is kept in a humid environment at more than 65% moisture content or cold environments with temperatures less than 13° C. This disease affects a significant amount of old toys. So cellars or attics should be avoided as storage locations for antique trains made with Zamac. 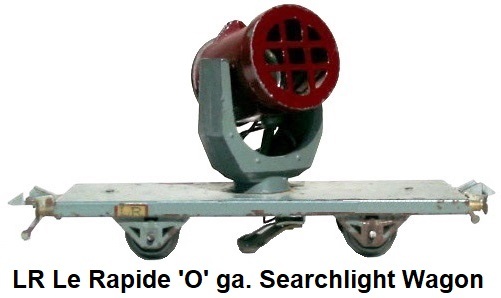 Because of the Zinc-pest problems, Le Rapide trains are very difficult to find in usable condition, and when they are, they are coveted by collectors.